The National Gallop is a celebration of Hungarian traditions and the countryside including traditional Hungarian horseback riding and hussar traditions. 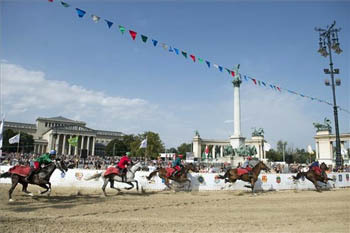 The main attraction of the event is the horse riding race to which any Hungarian citizen aged 18 and older can enter, male or female without weight limitations. Each year around 100 settlements nominate for the Vágta out of which riders are chosen through regional contests. The spectacular event takes place on the vast historic plaza, Hősök tere (Heroes’ Square), close to City park. If you had enough of the horses and the crowd you can head for the Zoo or the Széchenyi Bath. Apart from the horse riding race, the National Gallop is a large-scale cultural festival that enriches the colourful event palette of Budapest. 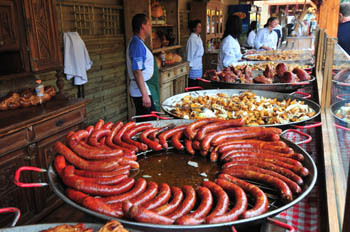 The “Kitchen of Hungary” (Magyarország Konyhája), and the “Wine Garden (Borkert)” offer a taste of local gastronomy and drinks. Come and celebrate the 10th birthday of the National Gallop. Join the dancers on Heroes’ Square and whirl away to the local tunes.